Morton, Adam 2016. Popery, politics, and play: visual culture in succession crisis England. The Seventeenth Century, Vol. 31, Issue. 4, p. 411. Rose, Jacqueline 2014. Religion and revolution in seventeenth-century England. The Seventeenth Century, Vol. 29, Issue. 3, p. 293. 1 See, esp., Scott, Jonathan, England's Troubles: Seventeenth-Century English Political Instability in European Context (Cambridge, 2000), 24, 29–30, 56–57, 166–73, 208–11, 412–13, 428–31, 455, Algernon Sidney and the Restoration Crisis, 1677–1683 (Cambridge, 1991), 3, 7–10, 16–17, 26–32, 126, and “England's Troubles: Exhuming the Popish Plot,” in The Politics of Religion in Restoration England, ed. Harris, Tim, Seaward, Paul, and Goldie, Mark (Oxford, 1990), 108–18. For an argument that anticipated Scott's interpretation in some respects, see Haley, K. H. D., “‘No Popery’ in the Reign of Charles II,” Britain and the Netherlands 5 (1975): 104–17. On “popery and arbitrary government,” see Scott, England's Troubles, 24–29, 112, 117, 142–43, 165–66, 184, 200–205, 225, 387–88, 471–72. 2 Harris, Tim, London Crowds in the Reign of Charles II: Propaganda and Politics from the Restoration until the Exclusion Crisis (Cambridge, 1987), 129–44, quotation at 131, Politics under the Later Stuarts: Party Conflict in a Divided Society, 1660–1715 (London, 1993), 70–71, 98–101, 108, 122, and Restoration: Charles II and His Kingdoms, 1660–1685 (London, 2005), 245–50; Scott, , Sidney and the Restoration Crisis, 46–49, and England's Troubles, 427–28, 435–37, 441–42, 445–46. See also Mark Goldie, “John Locke and Anglican Royalism,” Political Studies 31, no. 1 (March 1983): 71–74; Jacqueline Rose, “Robert Brady's Intellectual History and Royalist Antipopery in Restoration England,” English Historical Review 122, no. 499 (December 2007): 1306–10; John Spurr, The Restoration Church of England, 1646–1689 (New Haven, CT, 1991), 78. On the origins of the Whig and Tory parties in the late 1670s and early 1680s, see Harris, , Politics under the Later Stuarts, 8, 52–109; De Krey, Gary S., London and the Restoration, 1659–1683 (Cambridge, 2005), 272–331. The Whigs generally supported greater toleration for Protestant nonconformists and argued for some limits on the monarch's prerogative powers, while the Tories generally supported the perquisites of the Church of England and defended the royal prerogative. Jonathan Scott, who has argued that English political parties developed only after the Glorious Revolution, prefers the term “loyalists” for the pre-1688 political grouping that other historians have tended to describe as the “Tories”: see Scott, , England's Troubles, 440, 490–93. 3 On the supposed universal appeal of anti-popery among seventeenth-century English Protestants, see Scott, , England's Troubles, 29, 56, 184; Jones, J. R., “James II's Whig Collaborators,” Historical Journal 3, no. 1 (1960): 73, and “The Road to 1688,” Groniek 21, no. 101 (1988): 58; Robert Beddard, “Anti-Popery and the London Mob, 1688,” History Today, July 1988, 36. 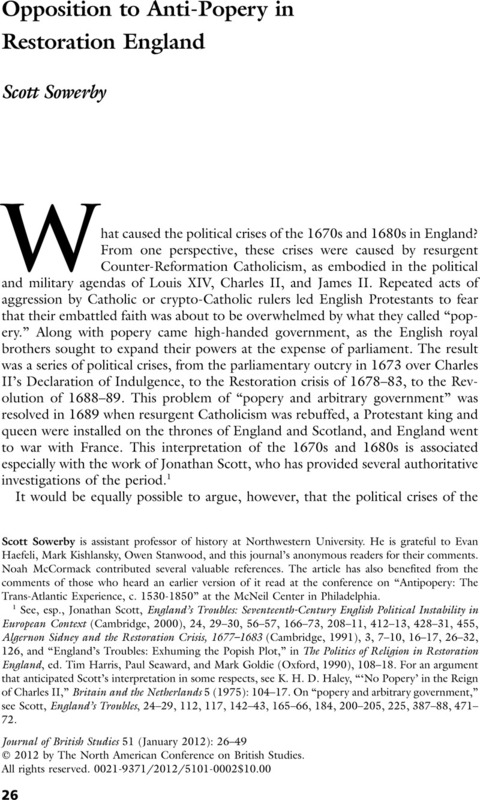 4 Scott, , England's Troubles, 56–57; Harris, , Politics under the Later Stuarts, 66; Rose, “Royalist Antipopery,” 1306; Pincus, Steven C. A., Protestantism and Patriotism: Ideologies and the Making of English Foreign Policy, 1650–1668 (Cambridge, 1996), 447–48; Clark, J. C. D., “Protestantism, Nationalism, and National Identity, 1660–1832,” Historical Journal 43, no. 1 (March 2000): 262; Starkie, Andrew, “Gilbert Burnet's Reformation and the Semantics of Popery,” in Fear, Exclusion and Revolution: Roger Morrice and Britain in the 1680s, ed. McElligott, Jason (Aldershot, 2006), 141–42. 5 Lake, Peter, “Anti-Popery: The Structure of a Prejudice,” in Conflict in Early Stuart England, ed. Cust, Richard and Hughes, Ann (Harlow, 1989), 74–75. 6 Goldie, “John Locke,” 84. 7 On Tory use of anti-popery against Whigs, see n. 2 above; on Whig use of anti-popery against Tories, see n. 26 below. 8 25 Car. II c. 2; 30 Car. II stat 2. c. 1; 11 Gul. III c. 4. 9 Milton, Anthony, “A Qualified Intolerance: The Limits and Ambiguities of Early Stuart Anti-Catholicism,” in Catholicism and Anti-Catholicism in Early Modern English Texts, ed. Marotti, Arthur F. (Basingstoke, 1999), 86–91, 110, Catholic and Reformed: The Roman and Protestant Churches in English Protestant Thought, 1600–1640 (Cambridge, 1995), 55, 60–72, 77–83, 529–30, and Laudian and Royalist Polemic in Seventeenth-Century England: The Career and Writings of Peter Heylyn (Manchester, 2007), 68, 89–90; see also Fincham, Kenneth, Prelate as Pastor: The Episcopate of James I (Oxford, 1990), 269–70. 10 For discussions of Tory critiques of particular anti-popish narratives, see Knights, Mark, “The Tory Interpretation of History in the Rage of Parties,” Huntington Library Quarterly 68, nos. 1–2 (March 2005): 360–62; Goldie, Mark, “Roger L’Estrange's Observator and the Exorcism of the Plot,” in Roger L’Estrange and the Making of Restoration Culture, ed. Duncan-Page, Anne and Lynch, Beth (Aldershot, 2008), 76–78, 87. For a discussion of the sympathies held by some Anglican Tories toward Catholicism in the Restoration period, see Baker, Geoff, “William Blundell and Late-Seventeenth-Century English Catholicism,” Northwestern History 45, no. 2 (September 2008): 268–70. 11 Marvell, Andrew, An account of the growth of popery, and arbitrary government in England (Amsterdam, 1677; Wing M860); L’Estrange, Roger, An account of the growth of knavery under the pretended fears of arbitrary government and popery (London, 1678; Wing L1193). References to “Wing” are from Wing, Donald, ed., Short-Title Catalogue of Books Printed in England, Scotland, Ireland, Wales, and British America and of English Books Printed in Other Countries, 1641–1700, 2nd ed., rev. Timothy J. Crist et al., 4 vols. (New York, 1982–98). These references are provided to assist readers in consulting the original pamphlets on Early English Books Online. 12 Even in a work as comprehensive as Tim Harris's London Crowds, Marvell's work appears in the bibliography while L’Estrange's does not. See also the bibliographies of Jonathan Scott, England's Troubles; Spurr, Restoration Church; De Krey, London and the Restoration; and Miller, John, Popery and Politics in England, 1660–1688 (Cambridge, 1973). An exception to this is Knights, Mark, who cited L’Estrange's tract in his Politics and Opinion in Crisis, 1678–81 (Cambridge, 1994), 17n, and in his “Tory Interpretation of History,” 360. 14 L’Estrange, Roger, The case put, concerning the succession of his Royal Highness the Duke of York (London, 1679; Wing L1206), 37; see also the critiques of anti-popery in Heylyn, Peter, Cyprianus Anglicus (London, 1668; Wing H1699), 93, 129, 178. 15 Letter by Roger L’Estrange, 23 August 1677, Beinecke Library, Osborn MS file 8998. 16 L’Estrange, Roger, Compendious history of the most remarkable passages of the last fourteen years (London, 1680; Wing L1228), 1–3. 17 Clarke, J. S., ed., The Life of James the Second, 2 vols. (London, 1816), 1:656; James II, To the most reverend fathers in God (London, 1685/6; Wing J389), 4; see also Clark, Andrew, ed., The Life and Times of Anthony Wood, 5 vols. (Oxford, 1891–1900), 3:239. 18 For my critique of the interpretation of Steve Pincus, who provocatively argued in his 1688: The First Modern Revolution (New Haven, CT, 2010) that confessionally based ideologies such as anti-popery were not a major factor in inspiring support for the Glorious Revolution, see my review article, “Pantomime History,” Parliamentary History 30, no. 2 (June 2011): 236–58. 19 D/Lons/L12/2/15: Daniel Fleming, “Memoirs of the family of the Flemmings,” vol. 2, fol. 140, Cumbria Record Office (Carlisle); Markham, Clements R., Life of Robert Fairfax of Steeton (London, 1885), 146. 20 Sowerby, Scott, “Tories in the Whig Corner: Daniel Fleming's Journal of the 1685 Parliament,” Parliamentary History 24, no. 2 (June 2005): 167–71, 175; Goldie, Mark, “John Locke's Circle and James II,” Historical Journal 35, no. 3 (September 1992): 558–59; De Krey, Gary S., “Reformation and ‘Arbitrary Government’: London Dissenters and James II's Polity of Toleration, 1687–1688,” in Fear, Exclusion and Revolution: Roger Morrice and Britain in the 1680s, ed. McElligott, Jason (Aldershot, 2006), 17, 29–30. 21 Diary of Sir Willoughby Aston, entry for 31 March 1685, Liverpool Record Office, 920 MD 173. See also Knights, , Politics and Opinion, 314–16, 345, 364; and Spurr, , Restoration Church, 267–68. 22 Goldie, Mark, Spurr, John, Harris, Tim, Taylor, Stephen, Knights, Mark, and McElligott, Jason, eds., The Entring Book of Roger Morrice, 7 vols. (Woodbridge, 2007–9), 4:9. 23 Journals of the House of Commons, 58 vols. (London, 1803), 9:704, entry for 10 January 1680/1; see also Harris, , London Crowds, 122–23. 24 See, e.g., Grove, Robert, Seasonable Advice to the Citizens, Burgesses, and Free-Holders of England (London, 1685; Wing G2158), 22–24; and Cooper, William Durrant, Trelawny Papers (London, 1853), 14–15, which reprints a letter of Jonathan Trelawny, bishop of Bristol, to the earl of Sunderland, dated 21 May 1686. For the hostility of Grove to many dissenters, see his Short Defence of the Church and Clergy of England (London, 1681; Wing G2160), 74–76; for Trelawny's hostility to dissent, see his charge to the clergy of the diocese of Winchester in 1708, printed in Sermon by the Rt. Rev. Sir Jonathan Trelawny, Bishop of Winchester (London, 1876), 52–54. 25 Burnet, Gilbert, Bishop Burnet's History of His Own Time, 2nd ed., 6 vols. (Oxford, 1833), 2:342–43, 3:104–6; de Beer, E. S., ed., The Diary of John Evelyn, 6 vols. (Oxford, 1955), 4:504, 516, 520, 538–39; Patrick, Simon, A Sermon Preached on Saint Mark's Day (London, 1686; Wing P844), 15–17, 26–27; Stillingfleet, Edward, The Doctrines and Practices of the Church of Rome Truly Represented (London, 1686; Wing S5590), 96, 102, 106, 145–61; Gee, Edward, The Catalogue of all the Discourses Published against Popery (London, 1689; Wing G454), 2–3, 5–8, 10–12, 14, 17, 20, 23, 26–27, 30–31; Spellman, W. M., The Latitudinarians and the Church of England, 1660–1700 (Athens, GA, 1993), 49–50; Coffey, John, Persecution and Toleration in Protestant England, 1558–1689 (Harlow, 2000), 28–29, 37–38, 209. 26 Harris, , Politics under the Later Stuarts, 12–13, 66; De Krey, London and the Restoration, 311–12. 27 Penney, Norman, ed., The Journal of George Fox, 2 vols. (Cambridge, 1911), 2:1–2; Library of the Society of Friends, London, Friends MSS, Book of Cases I, 98; Braithwaite, William, The Second Period of Quakerism (London, 1919), 179; Dunn, Mary Maples and Dunn, Richard, eds., Papers of William Penn, 5 vols. (Philadelphia, 1981–86), 1:367–68; Whitehead, George, Christian Progress (London, 1725), 569–89, 618–30; Penn, William, “Fragments of an apology for himself,” Memoirs of the Historical Society of Pennsylvania 3, pt. 2 (1836): 240–42, and The speech of William Penn to His Majesty, upon his delivering the Quakers address (n.p., ; Wing P1372A). 28 For Catholic opposition to anti-popery, see A remonstrance, by way of address (London, 1685; Wing R974B), 1–2; Sowerby, “Tories in the Whig Corner,” 182. 29 On references to “41 again” as a staple of loyalist polemic in the late 1670s and early 1680s, see Harris, , London Crowds, 134–45, and Restoration, 238–39; Scott, , England's Troubles, 26–27, 435–40, and “Exhuming the Popish Plot,” 123–25; Miller, , Popery and Politics, 178–79; Knights, , Politics and Opinion, 320–21, 362; and Beddard, R. A., “The Retreat on Toryism: Lionel Ducket, Member for Calne, and the Politics of Conservatism,” Wiltshire Archaeological Magazine 72, no. 3 (1980): 100. On Anglican “persecutors,” see Publick Occurences Truly Stated, no. 27 (21 August 1688). On anti-popery as “blind zeal,” see Pomfret, John, “Robert Barclay and James II: Barclay's ‘Vindication,’ 1689,” Bulletin of Friends Historical Association 42, no. 1 (Spring 1953): 37. 30 Bramhall, John, Bishop Bramhall's vindication of himself (London, 1672; Wing B4237), with preface by Samuel Parker; Marvell, Andrew, The rehearsal transpros’d (London, 1672; Wing M878); Parker, Samuel, A reproof to the rehearsal transprosed (London, 1673; Wing P473); Marvell, Andrew, The rehearsall transpros’d the second part (London, 1673; Wing M882). On Parker's views on Roman Catholicism, see Schochet, Gordon J., “Between Lambeth and Leviathan: Samuel Parker on the Church of England and Political Order,” in Political Discourse in Early Modern Britain, ed. Phillipson, Nicholas and Skinner, Quentin (Cambridge, 1993), 200, 208, and “Samuel Parker, Religious Diversity, and the Ideology of Persecution,” in The Margins of Orthodoxy: Heterodox Writing and Cultural Response, 1660–1750, ed. Lund, Roger D. (Cambridge, 1995), 122. 31 For L’Estrange's use of the word “anti-popery,” which may have been his invention, see n. 14. For his use of the phrase “fears and jealousies” to refer to fears of popery, see his Seasonable Memorial in Some Historical Notes (London, 1680; Wing L1301), 26, his Remarks on the Growth and Progress of Nonconformity (London, 1682; Wing L1296), 24, 28–29, 47, and his Brief History of the Times (London, 1687–88; Wing L1203), pt. 1, 10, pt. 2, 126. 32 McDowall, William, History of the Burgh of Dumfries (Edinburgh, 1867), 511. See also James II's speech to the Parliament of 1685, from Journals of the House of Commons, 9:756. 33 The Protestants remonstrance against Pope and Presbyter (London, 1681; Wing P1345 or P3852AB), 14. This tract is often attributed to William Penn, but Mary Maples Dunn has cast doubt on that attribution: see Papers of William Penn, 5:530. 34 T. D., Fears and jealousies ceas’d: or, an impartial discourse, tending to demonstrate, from the folly and ill success of the Romish politics, that there is no reason to apprehend any danger from popery (n.p., ; Wing D1884), 8. 35 Publick Occurrences Truly Stated, no. 8 (10 April 1688). 36 For similarly worded assertions that the Dutch were stirring up “fears and jealousies” in England, see Shute, Giles, A new naked truth, or, the sandy foundation of the sacramental test shaken (London, 1688; Wing S3709), 24–26; V.a.469, memoirs of William Westby, Folger Shakespeare Library, fol. 34. 37 Care, Henry, Animadversions on a late paper, entituled, a letter to a dissenter (London, 1687; Wing C505 or C505A), 37. 38 Rawlinson MSS, Bodleian Library, D850, fol. 38v, D852, fols. 229r–v. 39 Granville, Denis, “The Cheiftest Matters Contained in Sundry Discourses Made to the Clergy of the Archdeaconry of Durham,” in The resigned & resolved Christian, 2nd ed. (Rouen, 1689 and 1691; Wing G1940), pt. 2, 21, and “Things which Portend very Fatally to the Government and Church of England,” in Resigned & resolved Christian, pt. 4, 43–44. 40 See L’Estrange, Account of the growth of knavery, 9–10, 18, 21, 23–4; Journals of the House of Lords, 43 vols. (London, 1802), 13:222; Philipps, Fabian, Ursa major & minor, or, a sober and impartial enquiry into those pretended fears and jealousies of popery and arbitrary power (London, 1681; Wing P2019A), 1; Cartwright, Thomas, A sermon preached at Holy-Rood House (Edinburgh, 1682; Wing C704), 18; Granville, Denis, “A Discourse Concerning Christian Resignation and Resolution,” in Resigned & resolved Christian, pt. 1, 26. 42 Beddard, R. A., “Bishop Cartwright's Death-Bed,” Bodleian Library Record 11, no. 4 (May 1984): 220–30; The Diary of Dr. Thomas Cartwright, Bishop of Chester (London, 1843), 9, 44–48, 52, 80–81; James Bonnell to John Strype, 19 April 1689, Stowe MS 746, fol. 111, British Library [hereafter BL]. For Cartwright's Erastian submissiveness to civil government, see Fincham, Kenneth and Taylor, Stephen, “Episcopalian Conformity and Nonconformity, 1646–60,” in Royalists and Royalism during the Interregnum, ed. Smith, David L. and McElligott, Jason (Manchester, 2010), 36–37; Goldie, Mark, “The Political Thought of the Anglican Revolution,” in The Revolutions of 1688, ed. Beddard, Robert (Oxford, 1991), 135–36. 43 [Cartwright, Thomas], An answer of a minister of the Church of England (London, 1687; Wing C696), 23. This pamphlet, though anonymous, is attributed here to Cartwright due to the numerous parallel passages it shares with his Sermon preached upon the anniversary solemnity of the happy inauguration (London, 1686; Wing C706). 44 [Cartwright, Thomas], A modest censure of the immodest letter to a dissenter (London, 1687; Wing N76), 9, An answer, 24–25, 47, and A sermon preached upon the anniversary, 22; Johnston, Nathaniel, The king's visitatorial power asserted (London, 1688; Wing J879), 59; see also Diary of Cartwright, 30. On Cartwright's authorship of A modest censure, see Nathaniel Johnston to Sir John Reresby, 5 November 1687, West Yorkshire Archive Service, Leeds, WYL156/51/16; Diary of Cartwright, 85; and Mark N. Brown, “Bishop Cartwright's Answer to Halifax's ‘Letter to a Dissenter’ (1687),” Notes and Queries 21, no. 3 (March 1974): 104–5. 45 Ellis, Edmund [Elys], An epistle to the truly religious and loyal gentry of the Church of England (London, 1687; Wing E674), 6, 8, and The second epistle to the truly religious and loyal gentry of the Church of England (London, 1687; Wing E693), 6. 46 James II, To the most reverend fathers in God; Calendar of State Papers Domestic, James II, 1686–7, 56; The Works of the Most Reverend Dr. John Sharp, 7 vols. (London, 1749), 7:123–47; An exact account of the whole proceedings against the right reverend father in God, Henry lord bishop of London (London, 1688; Wing E3591), 7. 47 Goldie et al., eds., Entring Book of Roger Morrice, 3:281. 48 Alexander Taylor, ed., The Works of Symon Patrick, 9 vols. (Oxford, 1858), 9:502–5; Rawlinson MSS, Bodleian Library, A289, fol. 129; Goldie et al., eds., Entring Book of Roger Morrice, 4:312; James II, His Majesties gracious declaration to all his loving subjects for liberty of conscience (London, 1687; Wing J186), 4; The humble address of the Presbyterians ([London], 1687; Wing A2912), 7. 49 Schwoerer, Lois, The Ingenious Mr. Henry Care, Restoration Publicist (Baltimore, 2001), 23, 44–75, 210–16, 222–23; Brown, F. C., Elkanah Settle: His Life and Works (Chicago, 1910), 21–26; Philip Madoxe to Sir Robert Southwell, 28 August 1688, MS Eng. lett. c.54, Bodleian Library, fol. 97; Harris, London Crowds, 120. 50 Lobb, Stephen, The harmony between the old and present non-conformists principles (London, 1682; Wing L2726), 54–55; letter to Lord Herbert of Cherbury, 16 June 1688, The National Archives, Public Record Office, PRO 30/53/8/64; account by Adam Ottley of events in 1688, National Library of Wales, Ottley Correspondence no. 1467; diary of Roger Whitley, 1684–97, MS Eng. hist. c.711, Bodleian Library, fol. 91v; Goldie et al., eds., Entring Book of Roger Morrice, 4:44, 205, 212. 51 [Lobb, Stephen], A second letter to a dissenter (London, 1687; Wing L2729A), 5, 10. See also the same argument repeated by the anonymous author of Two plain words to the clergy (London, 1688; Wing T3527), 9–10. 52 Publick Occurrences, no. 15 (29 May 1688); Henry Care, Draconica: or, an abstract of all the penal laws touching matters of religion, 2nd ed. (London, 1688; Wing C511), 10, 15–17, 21. See also Publick Occurrences, no. 8 (10 April 1688), no. 17 (12 June 1688), no. 19 (26 June 1688), no. 23 (24 July 1688); Care, Animadversions on a late paper, 5–7, 13–15; Folger Shakespeare Library, Newdigate newsletters, L.c.1862, 27 September 1687. 53 Settle, Elkanah, A narrative (London, 1683; Wing S2700), preface and 24–25. See also Publick Occurrences, no. 32 (25 September 1688). 54 Wood, Anthony, Athenae Oxonienses, ed. Philip Bliss, 4 vols. (London, 1813–20), 2: col. 469; see also A letter from a clergy-man in the city, to his friend in the country, containing his reasons for not reading the declaration (London, 1688; Wing S3294B), 8; Brown, Thomas, Heraclitus ridens redivivus (Oxford, 1688; Wing B5060), 4. 55 Remarks upon E. Settle's narrative (London, 1683; Wing R943), 1, 3–5, 11; Reflexions upon a late pamphlet intituled, a narrative (London, 1683; Wing R716), 3–5; see also Settle, Elkanah, A supplement to the narrative (London, 1683; Wing S2720), 17. 56 Publick Occurrences, no. 18 (19 June 1688). 57 Care, Draconica, 40; An elegy upon the most ingenious Mr. Henry Care (London, 1688; Wing E483). 58 [Henry Care], A Discourse for Taking Off the Tests and Penal Laws about Religion (London, 1687; Wing D1593), 29–30, 36. For the attribution of this pamphlet to Care, see Folger Shakespeare Library, Newdigate newsletters, L.c.1859, 20 September 1687. 59 [Care, Henry], The legality of the court held by His Majesties ecclesiastical commissioners, defended (London, 1688; Wing C527), 38; Care, Animadversions, 37. On this point, see also Champion, Justin, “Willing to Suffer: Law and Religious Conscience in Seventeenth-Century England,” in Religious Conscience, the State, and the Law, ed. John McLaren and Harold Coward (Albany, NY, 1999), 19–21. 60 Whitehead, Christian Progress, 622; Shewen, William, A brief testimony for religion (London, 1688; Wing S3419), 17. 61 [Penn, William], A third letter from a gentleman in the country (London, 1687; Wing P1381), 11. For Penn's frequent belittling of anti-popery in the late 1680s, see Penn, William, Good advice to the Church of England (London, 1687; Wing P1296), 9, 49, A second letter from a gentleman in the country (London, 1687; Wing P1361), 11, 14, 16, and A third letter, 8, 14; James Rivers to [Hans Willem Bentinck], 13/23 January 1688, Nottingham University Library, PwA 2129/1. 62 [Popple, William], Three letters tending to demonstrate (London, 1688; Wing P1383), 21. For Popple's authorship of this pamphlet, see Caroline Robbins, “Absolute Liberty: The Life and Thought of William Popple, 1638–1708,” William and Mary Quarterly, 3rd ser., 24, no. 2 (April 1967): 190, n. 1. 63 An Answer from the Country to a Late Letter to a Dissenter (London, 1687; Wing A3278), 15, and see also 5, 8–11, 25, and 38 in this source. 64 Robert Yard to Sir Joseph Williamson, 24 November 1673, in Christie, W. D., ed., Letters Addressed from London to Sir Joseph Williamson, 2 vols. (Westminster, 1874), 2:82. 65 In addition to the pamphlets cited in the notes above, see also The present state of England in relation to popery, manifesting the absolute impossibility of introducing popery and arbitrary government into this kingdom (London, 1685; Wing S2711), reprinted without a preface as Salus Britannica: or, the safety of the Protestant religion, against all the present apprehensions of popery fully discust and proved (London, 1685; Wing S511). 66 Cartwright, Thomas, Sermon preached upon the anniversary solemnity of the happy inauguration (London, 1686; Wing C706), reprinted three times in 1686 (Wing C706A, C707, C708); Philipps, Fabian, Ursa major & minor (London, 1681; Wing P2019A), reprinted once in 1681 (Wing P2019B). 67 The Weekly Test-Paper, no. 4 (30 May 1688). 68 A dialogue between two Church of England-men ([London], ; Wing D1339A), 8. For another dialogue of this type, where one interlocutor took the anti-popish position and the other critiqued it, see A friendly debate upon the next elections of Parliament ([London], ; Wing F2218A). 69 Harris, London crowds, 98–100; Jones, J. R., The Revolution of 1688 in England (London, 1972), 227; James Rivers to [Hans Willem Bentinck], 23 May 1688, Nottingham University Library, PwA 2162/1; [John Northleigh], Parliamentum pacificum: Or, the happy union of king & people (London, 1688; Wing N1302), 3, 29, 33, 46–50, 68. 70 Fitzwilliam, John, A sermon preach’d at Cotenham (London, 1683; Wing F1106), 29; Kenrick, Daniel, A sermon preached in the cathedral-church of Worcester (London, 1688; Wing K307), 21, 25, 34–36; Cartwright, A sermon preached upon the anniversary, 22; Wyvill, Christopher, An Assize-Sermon Preached in the Cathedral-Church of St. Peter in York (London, 1686; Wing W3783), 25–26. For a critique of anti-popery that appears to have been directed mainly to a learned audience, see How the members of the Church of England ought to behave themselves under a Roman Catholic king (London, 1687; Wing H2961). 71 Robinson, Amy Edith, ed., The Life of Richard Kidder, D.D., Bishop of Bath and Wells, Written by Himself (London, 1924), 38–39; see also A Letter to a Gentleman at Brussels (London, 1689; Wing L1658), 8. 72 Elys, The second epistle, 8; A Letter Containing Some Reflections, (n.p., ; Wing L1357A), 4, 1–2. 73 Popple, William, A letter to Mr. Penn, with his answer ([London], 1688; Wing P2964), 2; The Fourth (and Last) Collection of Poems, Satyrs, Songs (London, 1689; Wing F1684), 25; letter to William Penn, n.d., BL, Add. MS 34727, fol. 157; American Philosophical Society, Philadelphia, William Penn papers, 974.8 P365, vol. i, 120; letter from John Hough, 9 October 1687, BL, Add. MS 4292, fol. 8; Burnet, History of His Own Time, 3:140; marginal notation in Bodleian Library, Nichols newspapers, Publick Occurrences Truly Stated, no. 12 (8 May 1688). 74 London Gazette, no. 2259 (11–14 July 1687), no. 2270 (18–22 August 1687), no. 2323 (20–23 February 1688), no. 2318 (2–6 February 1688); see also Clarke, ed., Life of James the Second, 2:170; London Gazette, no. 2238 (28 April–2 May 1687), no. 2359 (25–28 June 1688). Although several of the addresses sent to the king in 1687 and 1688 were based on a set form sent down from above, there is no evidence that these particular addresses were penned by anyone other than the groups who sent them, and the diversity of their language suggests they were not centrally dictated. On this point, see Marquess of Halifax, A Letter to a Dissenter (London, 1687; Wing H311), 3–4; Henry Care, Animadversions on a Late Paper Entituled, A Letter to a Dissenter, 24–25; Lacey, Douglas, Dissent and Parliamentary Politics in England, 1661–1689 (New Brunswick, NJ, 1969), 180–81; and Harris, Tim, Revolution: The Great Crisis of the British Monarchy, 1685–1720 (London, 2006), 216, 219–20. 75 Colley, Linda, Britons: Forging the Nation, 1707–1837 (New Haven, CT, 1992), 53–54; Claydon, Tony and McBride, Ian, “The Trials of the Chosen Peoples: Recent Interpretations of Protestantism and National Identity in Britain and Ireland,” in Protestantism and National Identity: Britain and Ireland, c.1650–c.1850, ed. Claydon, Tony and McBride, Ian (Cambridge, 1998), 26–29; Stanwood, Owen, The Empire Reformed: English America in the Age of the Glorious Revolution (Philadelphia, 2011), 4–5, 177–206. 76 Granville, Denis, “The Deane of Durhams Reasons for his Withdrawing into France,” in Resigned & resolved Christian, pt. 3, 25, “To the Bishop of Durham,” in Resigned & resolved Christian, pt. 4, 4, and “To the Vice-Dean & Prebendaries of the Cathedrall Church of Durham,” in Resigned & resolved Christian, pt. 4, 18. 77 [Ferguson, Robert], A Letter to a Person of Honour, concerning the Black Box ([London], ; Wing F749), 4–5, A Letter to a Person of Honour, concerning the Kings disavowing the having been Married to the D. of M.'s Mother ([London], ; Wing F750), 15–18, An Enquiry into, and Detection of the Barbarous Murther of the Late Earl of Essex (n.p., 1684; Wing F737), 13–16, 19–20, Representation of the Threatning Dangers (n.p., ; Wing F756A), 1–21, and A Brief Justification of the Prince of Orange's Descent into England (London, 1689; Wing F732 or F733), 19, 22–23. 78 [Robert Ferguson], Whether the Preserving the Protestant Religion was the Motive (n.p., 1695; Wing F766), 11–13, 9, 19, 26. 79 Ferguson, Robert, The History of the Revolution (n.p., ), 7, 11–13, 23–24, 27, 32. On Jacobite critiques of anti-popery, see also Goldie, Mark and Jackson, Clare, “Williamite Tyranny and the Whig Jacobites,” in Redefining William III: The Impact of the King-Stadholder in International Context, ed. Mijers, Esther and Onnekink, David (Aldershot, 2007), 189. 80 On Titus Oates, the informer whose wild tales of Catholic assassins fueled the furor over the Popish Plot, see Kenyon, John, The Popish Plot (London, 1972), 45–76. 81 “A Remedy to the fears & Jealousys, w[hi]ch the King of Englands Non:papist subjects, may conceive concerning their being forc’t from their Religion,” BL, Add. MS 72888, fols. 92–99v; Hull, Charles Henry, ed., The Economic Writings of Sir William Petty, 2 vols. (Cambridge, 1899), 2:550, 591–92; McCormick, Ted, William Petty and the Ambitions of Political Arithmetic (Oxford, 2009), 248–58.